The ability to create functional biomolecules through bioconjugation has affected every discipline of life sciences. 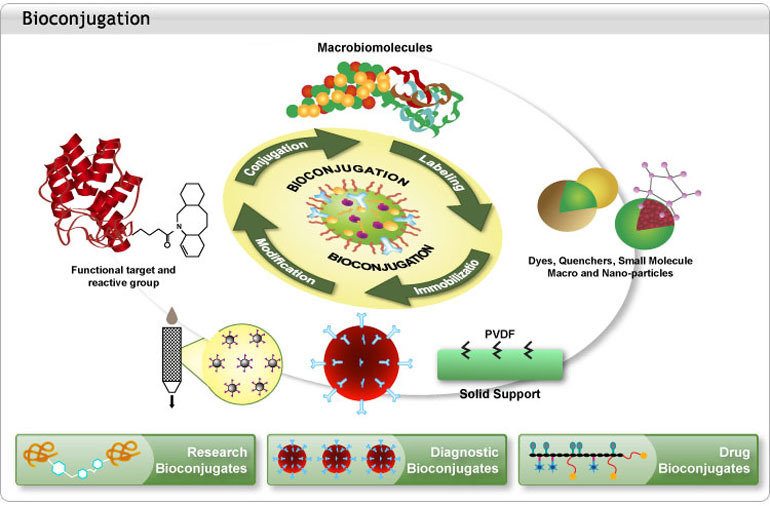 As new cross-linking techniques and reagents are developed, novel applications in ligand discovery, disease diagnosis, and high throughput screening are being advanced through the development of new unique bioconjugates. These methods owe their existence to the discovery of chemoselective reactions that enable bioconjugation under physiological conditions. Bio-Synthesis, a leading biology CRO, focuses exclusively on early drug discovery and development services. Relying on our state-of-the-art manufacturing facility and over 30 years of combined experience in complex API conjugate technologies, our bioconjugation-based drug discoveries and development programs have delivered thousands of hybrid complexes that are supported by our in-house bioanalytical laboratory with a full spectrum of analytical tools capable of producing technically challenging yet safe and efficacious drug conjugates. From project scope analysis and problem solving proposals, to complex biopolymer production and assay development, we strive with competence and confidence to meet your demand for creating novel conjugates that can be quickly and cost-effectively added to your value chain. At Bio-Synthesis, custom bioconjugation reagents are manufactured under a strict quality control process to assure customers' complete satisfaction. Our sizeable investment in state-of-the-art analytical equipment provides industry-leading tools to develop and monitor our process. Complementary techniques, such as analytical chromatography and electrophoresis, are routinely used to verify that specifications are met. Sometimes, if the biopolymer is not too massive, mass spectroscopy can be used to determine its molecular weight. However, unless a crystal structure is available or a single unique functional group was used for custom conjugation, it may be difficult to know the exact conjugation site and the molar ratio of the reactants. Because of this complexity and difficulty, the effort required assessing the composition and purity of a bioconjugate depends largely on the requirements of downstream research. At Bio-Synthesis, we strive to meet your demands for developing pre-clinical drug candidates and innovative reagents.